I am really proud to say that "I work at Purple". The factors that have influenced my decision to continue with the organization have been their strong values and their support at every stage. My team, peers as well as managers encourage us to think-out-of-the-box and this has given me an opportunity to learn a lot. Our performance gets the recognition it deserves and that motivates us to get better every day. 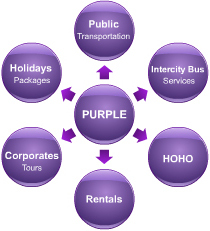 Purple is a place where each employee is valued and talented people are quickly recognized and rewarded. I have thoroughly enjoyed working with Purple. Pleasure in my job puts perfection in my work. Working at Purple has been a pleasurable experience throughout. I could not have asked for a better work place and a better organization in order to satisfy my professional quest. The daily work pressure and challenges, just seem to melt away with great mentors and leaders who guide us every step of the way. I have been associated with Purple for many years. My stint with the organization and the opportunity to interact with different business functionaries has given me immense amount of satisfaction and helped me learn a lot. Purple's environment offers numerous growth opportunities to the team at every stage. I truly feel that an individual with the right attitude and zeal to achieve, is given all the independence and support to unleash his potential.